This healthy homemade granola is a breakfast staple in our house. Homemade granola is simple to make and can be easily customized to meet any dietary needs or preferences. Plus, this granola recipe is vegan, gluten-free, dairy-free and contains only a small amount of natural sweetener! What encouraged me start making my own granola? I began to pay attention to the amount of added sugar in the foods we eat. When I reread our “staple” granola ingredients looking specifically at sugar, I found that sugar was the second ingredient after oats! Simply eating granola in the morning with my then-favorite yogurt supplied 18 grams (4.5 teaspoons) of added sugar to my daily diet. Did you know that the American Heart Association recommends that women eat no more than 6 teaspoons of added sugar a day? And the AHA recommends children have less than 5 teaspoons of added sugar a day! Why is this granola healthy? 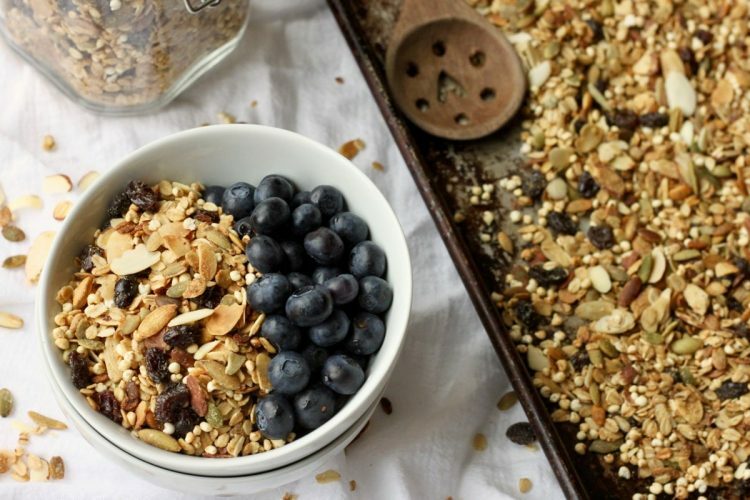 This healthier granola recipe is very adaptable. You can use any nuts or seeds that you like. Simply keep the ratio consistent: 6 cups grains (rolled oats, puffed grains, etc), 3 cups nuts and 3 cups seeds. If you eat a nut-free diet, replace all of the nuts with seeds or other optional mix-ins like coconut chips or puffed grains. The liquid portion of this healthier granola recipe is equally adaptable. 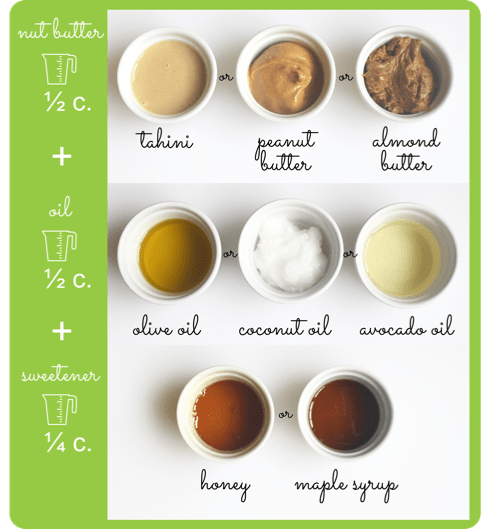 Again, keep the ratios consistent: 1/2 cup seed or nut butter, 1/2 cup oil, and 1/4 cup sweetener. Just remember to add the fruit after cooking the granola! Trust me, baked raisins are not delicious. This protein packed homemade granola is easy to make, delicious, and low in added sugar. A 1/2 cup serving contains almost 9 grams of protein and just 2 grams added sugar. We like to eat this granola either with milk or as a toping on greek yogurt and fruit for a filling, delicious breakfast. My boys love it mixed 50:50 with “puffies” (puffed wheat, rice or millet) and topped with milk. *Note: I choose to purchase organic oats and raisins. Last year, the Environmental Working Group (EWG) tested many popular oat-based cereal and granola bars for glyphosate (Roundup) residue. 43 of the 45 products tested contained glyphosate residue. While some of the organic oat-based products also contained glyphosate residue, the levels were found to be much lower. Read the full EWG report here. Grapes consistently test positive for pesticide residues, including organophosphate pesticides. That is why I choose to buy organic raisins. Read more about pesticides and produce. Oats are naturally gluten free. However, some oats are processed on the same equipment as wheat and other gluten-containing foods, so it is possible that they can be contaminated with gluten. Some manufacturers dedicate a specific line to producing oats that are free from any possible gluten contaminants and label their oats as gluten free. Have you tried making homemade granola? What is your favorite combination? Another granola combination my family enjoys is this apricot maple pecan granola with toasted coconut. Originally published in Oct, 2017, this recipe has been updated with enhanced instructions and refreshed photos. Love the mix and match nature of this recipe. Many different ways to enjoy homemade granola. Thanks Michelle! I definitely like the flexibility of this recipe… it is great for cleaning out a pantry or meeting specific tastes / dietary requirements. Beautiful post! I love all the care that you’ve taken to accommodate all the different dieters. Homemade is best! Thank you Colleen! Homemade granola is such an easy way to make sure you know exactly what you are eating. 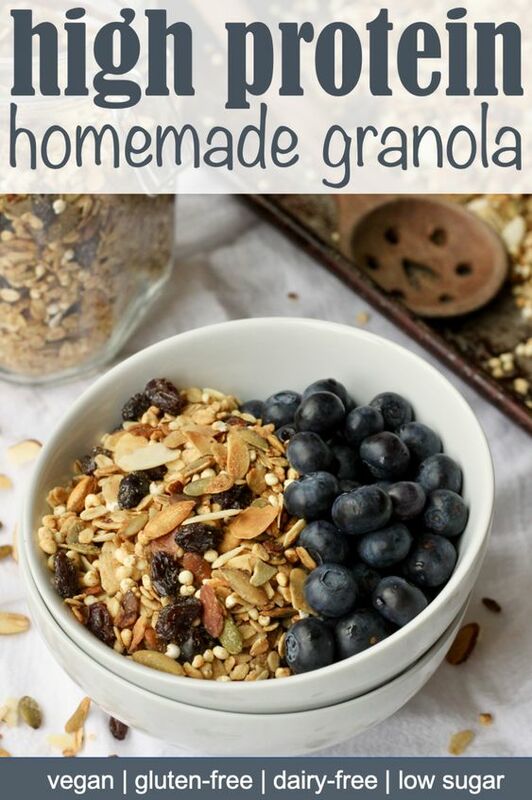 I love homemade granola, and this one looks particularly delicious! I love how healthy and balanced it is! Love granola! And homemade is ALWAYS better! Ahhh, yes!! I enjoy granola, but I’ve kinda gotten away from eating it because of what I’ve heard about sugar. Now I can enjoy it again. Yum!!! You’re so right about added sugar in the store bought variety!! And why buy it when making it is so simple?! I’m sold! Thanks Tatiana! 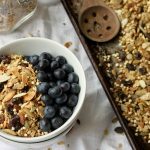 I would love to hear how you like this granola recipe and what modifications you try! I love your cute little charts. They are so helpful for building the granola with whatever ingredients we have! Thanks for sharing. I am often shocked at how much sugar is in granola when I look at the boxes they sell in store. It’s SO much better to make your own! Love all the different options you have offered here. Thanks so much Monique – I would love to hear which combination is your favorite! I love making homemade granola it’s always so much more delicious and healthier than store bought. Also love that you’ve added avocado oil in this! Thanks Carrie – Yes! With homemade granola you can add all your favorite nuts / seeds / ingredients and skip all the parts you don’t love! 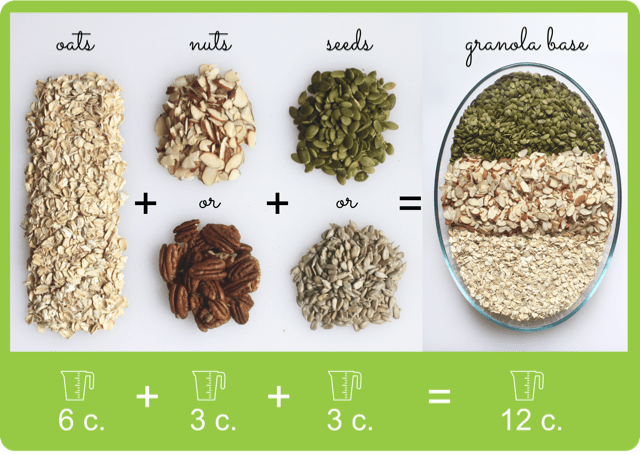 Great recipe and I love how you give all these options so that we can customize our own granola depending on our diets. Yay for less sweetener and only good fats in homemade! I love a good homemade granola, and yours looks so yummy. I bet they are delicious over yogurt! Thank you Jean! It is very yummy – I hope you enjoy the granola! Beautiful recipe. I am sure I’d love it alone or sprinkled on a smoothie bowl! Thanks Linda! My favorite is definitely sprinkled on top of yogurt or a smoothie bowl! Great tutorial! i love all the visual options on ways to make it your own! I like versions with all the above, it is fun to play with! Thanks Tessa! I also enjoy granola with lots of goodies in it! It really is shocking how much sugar is in store-bought granola. And it’s marketed as “health food”! I love the ability to control the ingredients! I completely agree Lindsey… the amount of sugar in store-bought granola is truly shocking. 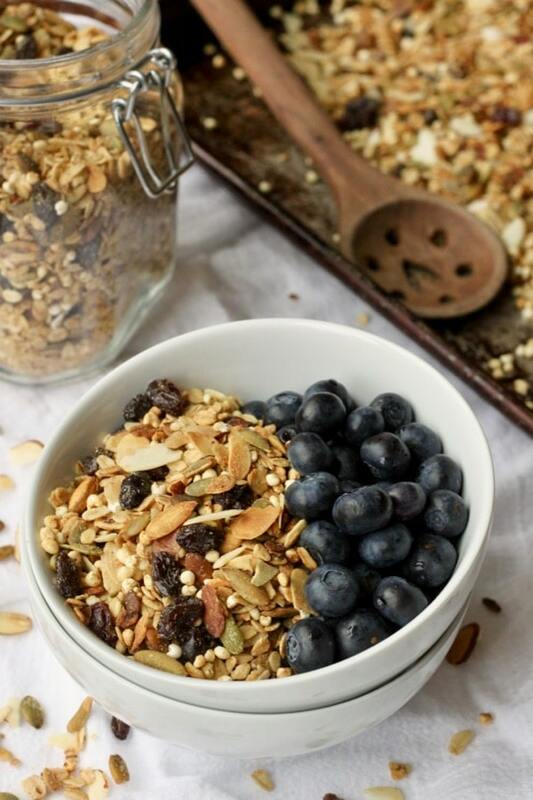 For me, being able to add my family’s favorite ingredients in homemade granola is an easy way to make a favorite first meal of the day healthier and a crowd pleaser.